Tehran (AsiaNews) - The heavy floods that have hit Iran in recent weeks have caused damage of at least 2.5 billion dollars due to the collapse or damage to bridges, houses and agricultural land according to state media. Meanwhile US sanctions continue to hinder the entry of aid for a country in serious difficulties. The floods started on March 19 last and so far have caused at least 76 victims; added to these are the more than 220 thousand people left without housing and forced to find shelter in the reception centers set up by the government and by the NGOs operating in the area. The authorities have also deployed the army to deal with the emergency. Interior Minister Abdolreza Rahmani Fazli, quoted by the official Irna agency, underlines "recent floods are unprecedented ... affecting 25 provinces and over 4400 villages". The damages, he continues, amount to about 350 trillion rials (equal to 2.5 billion dollars). Transport and Development Minister, Mohammad Eslami, adds that there are about 14 thousand km of damaged roads and more than 700 destroyed. The Iranian authorities point out that the floods have not affected the oil sector and that the greatest damage is registered in the agricultural sector. The government hopes to provide adequate compensation and, to cover the necessary sum, Iranian president Hassan Rouhani asked the great ayatollah Ali Khamenei to be able to withdraw two billion from the sovereign fund. The supreme leader has reportedly agreed, although he specified that he would use the National Development Fund "if there are no other sources available". 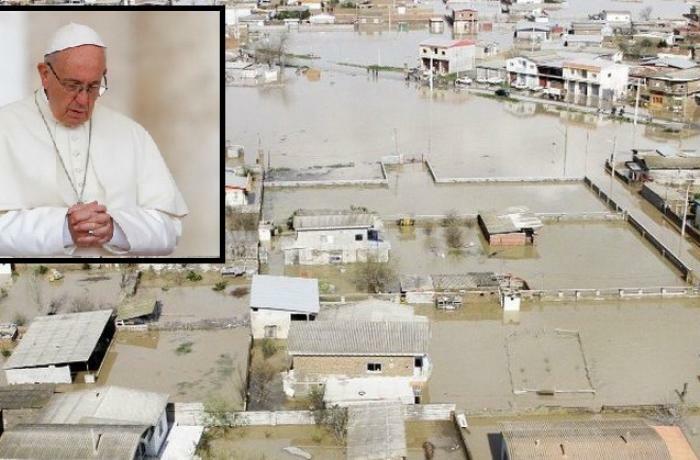 Over the weekend Pope Francis ordered the allocation of 100 thousand euros in aid to the people of Iran hit by the tragedy. The money will be sent by the Department for the Integral Human Development and will be entrusted to the apostolic nunciature in Tehran, which will then distribute it in the areas of greatest need. In a note published in the Holy See bulletin there is talk of a response to "this first phase of the emergency". "This sum - continues the communiqué - which aims to be an immediate expression of the sentiments of spiritual closeness on the part of the Holy Father towards the people and territories affected, will be shared [...] among the areas most affected by the catastrophe and will be used in relief and assistance to people and territories ”. Caritas Iran experts and volunteers have already visited some of the most affected areas and, in collaboration with other NGOs, is working to bring relief to the population. Previously, the pontiff, in a telegram of condolences signed by Secretary of State Pietro Parolin, expressed deep sorrow for the loss of human lives and assured his prayer for humanitarian workers, entrusting the Iranian people to the providence of God.